50 Cream Pie. 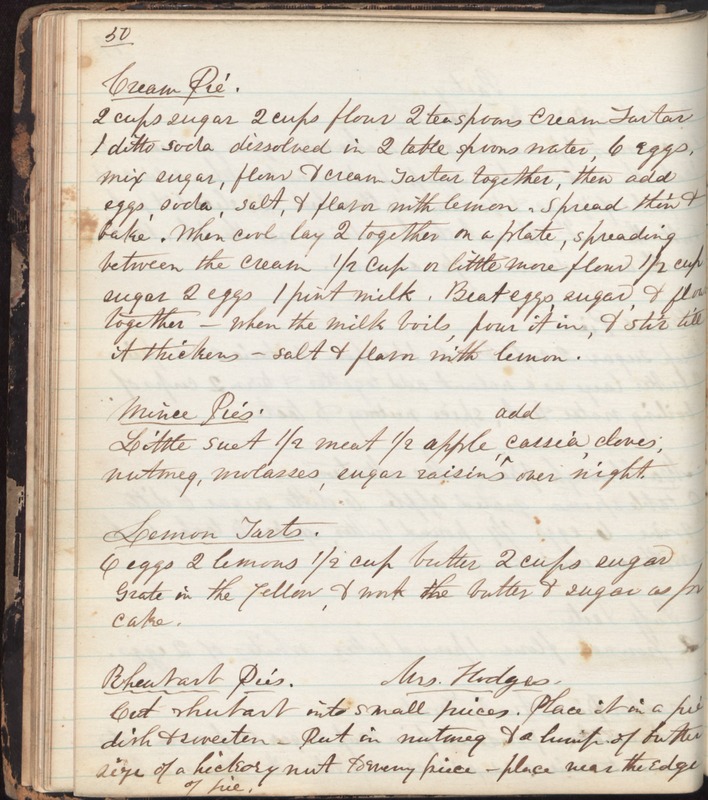 2 cups sugar 2 cups flour 2 teaspoons Cream Tartar 1 ditto soda dissolved in 2 table spoons water, 6 eggs, Mix sugar, flour & cream Tartar together, then add eggs, soda, salt & flavor with lemon. Spread thin & bake. When cool lay 2 together on a plate, spreading between the cream 1/2 cup or little more flour 1/2 cup sugar 2 eggs 1 pint milk. Beat eggs, sugar & flour together - When the milk boils, pour it in & stir till it thickens - salt & flavor with lemon. Mince Pies Little suet 1/2 meat 1/2 apple Add cassia, cloves, nutmeg, molasses, sugar raisins over night. Lemon Tarts 6 eggs 2 lemons 1/2 cup butter 2 cups sugar Grate in the yellow & work the butter & sugar as for cake. Rheubarb Pies. Mrs. Hodges. Get rhubarb into small pieces. Place it on a pie dish & sweeten. Put in nutmeg & a lump of butter size of a hickory nut to every piece. Place near the edge of pie.